So whether you’re going on a road trip or just popping down to the shops, the Nissan Micra makes every trip – an adventure. 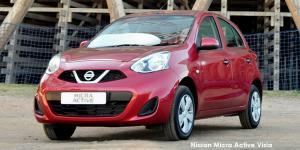 The Nissan Micra has a deceptively spacious interior even though it is compact on the outside. There are no shortcuts on driver and passenger comforts, which provides a fancy-free and pleasant driving experience void of complicated gadgets and unusable features. The Nissan Micra comes standard with everything a driver needs to make their journey safely, stylishly and in great comfort. Over and above the features mentioned, fold the rear seats down and the already very large 265 litre boot is made even bigger, making it more than just a compact run-around. The compact Nissan Micra is jam-packed with tech and luxury driving features to keep you entertained, comfortable and actively engaged in your driving journey. • Keep the tunes pumping with the 1.5 Tekna that comes standard with an enviable audio and Bluetooth hands free system with steering wheel control for safer driving and less distraction. Beyond the sheer uniqueness of the interior features, the cutely confident compact car ha one of the smallest turning circles (roughly 9cm) which makes it one of the country’s ideal city street and urban-friendly car on the market. If you thought active and passive safety features are features you can only find in the elite range of vehicles on the road – you’d be mistaken. Selected models of the Nissan Micra are packed with these features to protect drivers and passengers during unpredictable situations. High-quality 3-point seatbelts, optimal seat belt tensioners as well as remote central locking – that comes standard in all models. Love what you see? Check out our range of Nissan Micra’s or contact us today to chat about your business or personal vehicle needs and let our highly-trained sales staff at William Simpson assist you.